16 row pleaters are for pleating shorter height bodice panels on childrens's wear. 24 or 32 row pleaters will do chlldrens and wider adult garment and home dec pleating. Holds thread and pleater for 24 row pleaters (regular and Maxi.) Saves time-no more tangles. 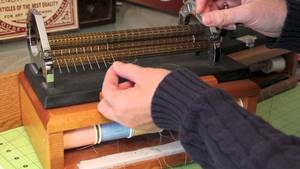 Unique thread tension divise. Kiln dried Red Oak. Complete with hardware to attach pleater. Removable pleater platform. Smoc 'N Genie Thread Caddy is a wonderful, time-saving tool for anyone who pleats. It is perfectly designed to hold your pleater securely on top. You fasten the pleater down with 4 clips (included). Rubber feet keep your caddy and pleater from slipping and protect your tabletop. Underneath the lid are dowel rods to hold your spools of threads or wound bobbins. Your thread is run between 2 strips of Velcro - keeps thread in place and prevents tangling. This is a wonderful tool for everyone who dreads threading all those needles every time they want to pleat multiple items (such as inserts). You may pleat more than one garment without re-threading the needles. It's a must have for all pleater owners!! Fits 24 row Amanda Jane, Sally Stanley, and 24 row Read (not Maxi) pleaters. Mount your pleater on this unfinished oak veneer thread box. It will hold 16 or 24 large spools of up to nylon quilting thread directly under pleater with the top cover supporting the pleater. The top cover is fastened to the thread box with velcro so you can quickly add or change thread by pulling the top off. You may pleat more than one garment without re-threading the needles. Very compact, a great accessory for organizing your thread and keeping 16 to 24 threads from becoming tangled. Mount your pleater on this oak veneer cabinet. 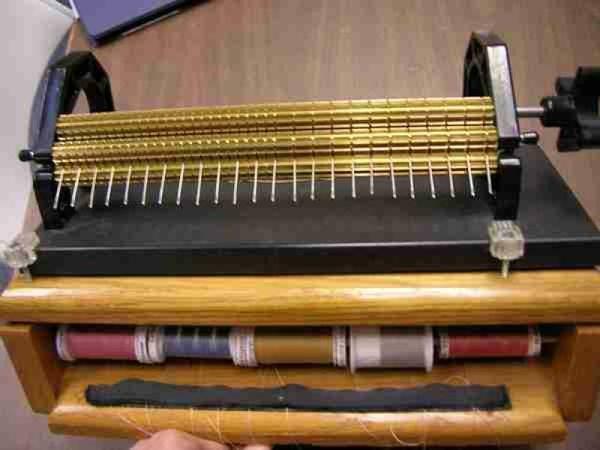 It will hold 16, 24, or 32 large spools of thread directly under your pleater. You can easily pleat more than one garmet without having to rethread your needles between each one! This is a very compact and highly-functional accessory that will make pleating a breeze. Once you've used the Smoc'n Genie, you won't know how you ever did without! I've been looking for one of these for a few years...in anticipation of smocking for my granddaughter. Thanks! Excellent experience from beginning to end. Thank you for allowing me to comments. The lady that in charge of the thread box went out and measure the box to make sure it would fit my machine. What great service. After receiving my genie box I needed assistance with assembly and received help quickly and with southern courtesy, which was greatly appreciated. Thanks! Staff are awesome. Prices were lower, although I did not realize this at first. Would order again, most definitely. Experience was very professional and personal. Thanks! I'll order again in the near future. I had difficulty attaching the pleater to the thread box. I misunderstood the directions. However, Betty called me right away and she was able to explain what I was doing wrong. I am now enjoying my pleater and thread box. Shipping was quick! I'll be ordering from AllBrands again in the future. Thank you! good communication, easy to reach on the phone, most items free shipping. I am a very happy repeat customer. Thank you. In general, I was very pleased with your service and product. I think you have excellant customer service staff. I'm a repeat customer. Great product and fast shipment as usual. I purchased the thread box for my wife. It arrived safe, quickly, and in excellant condition. She will open the gift for Christmas. I will tell her of my extreme satisfaction in which it was delivered. Thank you! I am very pleased with the whole transaction! I often recommend your company to my friends-your prices are usually less especially when there is no shipping charge. Nice selection, too! The pleater was sent overnignt, the dvd a little later, but it took the thread box about two weeks or more to come. This would not be enough to stop me from ordering from your company. Overall, I was extremely satisfied with my order and the way it was handled. Thank you very much. Your free mailing made it possible for me to buy more items for the missionary we were purchasing the products for. Thank you!! Allbrands is a great company. I continue to come back and buy from you time and time again. Please keep up the good work with great prices and fast shipping.